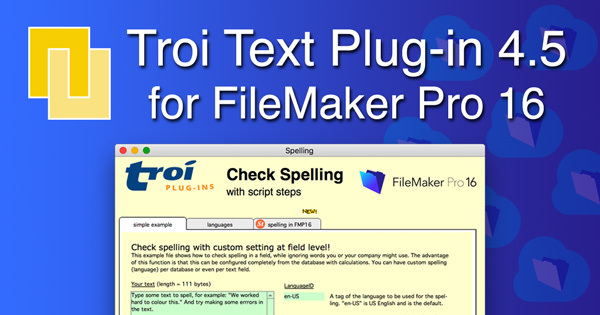 Text manipulation plug-in adds new script steps and online help for FileMaker Pro 16. The European FileMaker Developer Conferences are behind us. 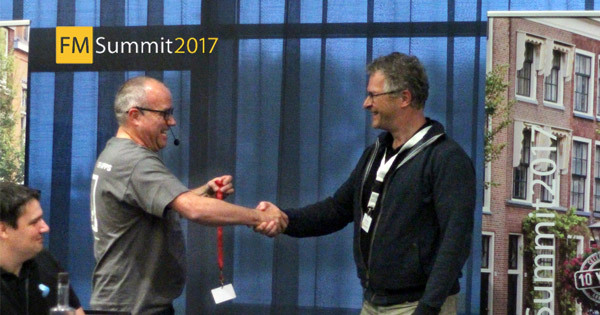 Troi Plug-ins was a proud sponsor and visitor of the 10th FMSummit 2017 held in Leiden. Returns all lines that are both in text1 and text2. Returns the start position and length of the first word which is spelled incorrectly in the text. Returns the n-th line of the text. The end of a line is determined by the return character ¶. This function returns all characters including the return character. Returns a list of all supported spelling languages. Adds a word to the spell checker dictionary. Returns all lines in text1 that are NOT in text2. Sets the list of words that should be ignored. Returns all lines from theText sorted in alphabetical order. The direction of the sort is determined by the switches.